An important community project in Kendal can continue to make a difference to people’s lives thanks to a cash donation. King’s Food Bank, based in the Shakespeare Centre has been awarded a total of £11,000 to keep hunger at bay for South Lakeland residents. £10,000 came from the Cumbria Fund, £500 from the Dowker Bindloss Fund, and £500 from the Castle Green Grassroots Fund. All three funds are administered by Cumbria Community Foundation. Thanks to funding, the Food Bank can continue to employ part-time Manager, Rachel Ellis, the only paid member of staff, and rental costs of the centre. Rachel said: “In continuing with our emergency intervention project, we will be helping to combat child poverty in Kendal. We receive between 20-30 referrals every week and half of the meals we deliver are for children. King’s Food Bank, which is supported by churches and other community groups, delivers food boxes to people who are temporarily unable to provide for themselves. It has delivered over 60,000 food boxes since opening in 2013. According to the Institute for Fiscal Studies 2013, one in five children in Underley and Kirkland is living in relative poverty. 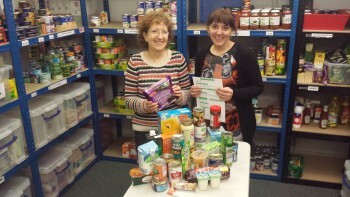 Demand is increasing for the service with the next nearest food bank at Windermere.